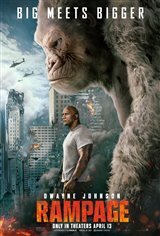 Primatologist Davis Okoye (Dwayne Johnson) has raised George, an extraordinarily intelligent silverback gorilla, since he rescued him when the young ape was just two years of age. The two have developed a very close bond, with Davis teaching him sign language so they can communicate. When Davis brings people to meet him, George likes to play practical jokes on them, such as pretending to be vicious. When George is infected by a serum, he grows larger and becomes unpredictable, as well as violent. Desperate to know what is happening to his friend, Davis connects with Dr. Kate Caldwell (Naomie Harris), who tells him George must have undergone genetic editing, giving him increased speed and strength. To make matters worse, it's soon discovered that an alligator and a wolf have been similarly altered. Davis and Kate discover that George has been experimented on by Claire Wyden (Malin Akerman) and a team of scientists for something called Project Rampage. As the animals descend on a city, destroying everything in sight, Davis and Kate risk their lives to try to find an antidote, not only to keep people from being hurt, but to save George's life. A big screen adaptation of the beloved 1980s arcade game Rampage. Canadian Connection : Director Brad Peyton was born in Gander, Newfoundland.